Mircea Eliade was an influential Romanian historian of religion, philosopher, and professor. His leading works dealt with religious experience. He theorized that the human experience of reality fell into either the sacred or the profane. He believed that religious phenomenon could not be reduced to a product of culture and history. Comparing numerous religions, from the primitive to the institutionalized, he concluded that, in religious experience, there is an objective purpose established by mythical events, to which man conformed himself. He also concluded that, in secular thought, meaning and purpose have to be invented and imposed by man himself - a primary cause of modern man's anxieties. He noted that secular man cannot escape religious experience; Contemporary social events, literature and arts, have similarities to traditional initiation rituals and mythical motifs. Even science resembles the sacred experience of yearning for the absolute origin, function and meaning of nature. Some of Eliade's observations at least partially explain the popularity of New Age movements in the West. Man has an inherent yearning to return to the sacred time - that which has value. It is not surprising that new movements based on old traditions like the Hare Krishna Movement are founded in the West. While there is a move towards secular life in India, in the West, New Age Spirituality is becoming increasingly widespread. 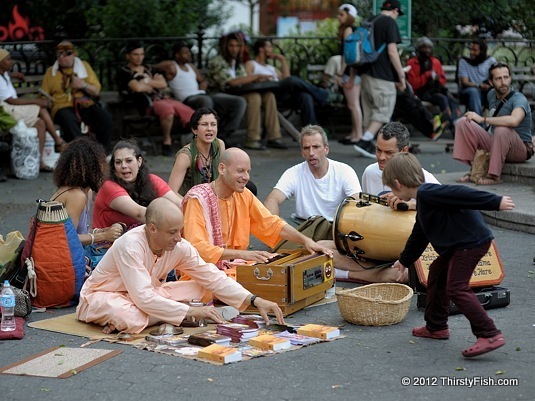 The Hare Krishna Movement, (ISKCON), is a religious organization that was founded in New York City in 1966. It is based on the Gaudiya Vaishnavism tradition of Hinduism. It is the most visible of Hindu religions in the West, and members can be seen in urban centers chanting the popular Hare Krishna mantra. Hare, as the vocative of Hari, is another name of the supreme God Vishnu that means "he who removes illusion". The Wikipedia article on the concept of illusion in Indian religions, Maya, is a well written introduction. I would also recommend the similar Buddhist concept of Kleshas.